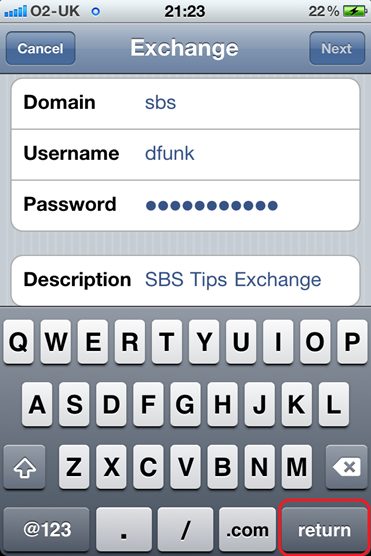 I’ve noticed a lot of people are hitting my blog with search terms like SBS2011 iPhone or words to that effect. I got to thinking that maybe some people are not interested in the technical detail in my previous posts about iPhones or iPads, and maybe they just wanted to know how to add their Exchange email to their device. 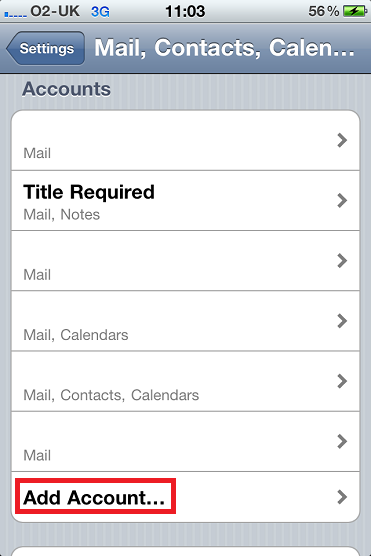 If you want to know how to configure your iPhone with Office 365 look here. 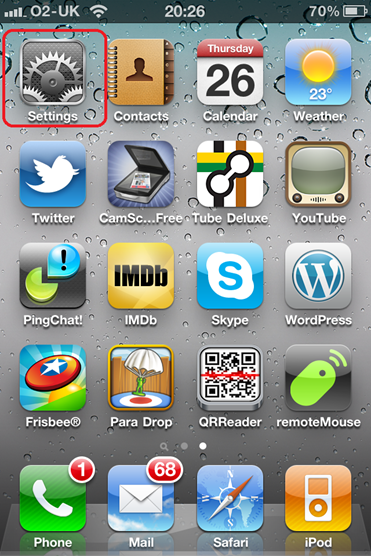 If you are looking for information on the iPhone Configuration Utility, look here. If you are looking for information on the iPhone and AutoDiscover, look here. If you just want me to shut up and tell you what settings you need to make your iDevice work with your new Exchange Server, read on! First from the Home screen, go to Settings. You are then asked for 5 pieces of information. This is the username you use when you logon to your computer in the office. The password you use when you logon to your computer in the office. 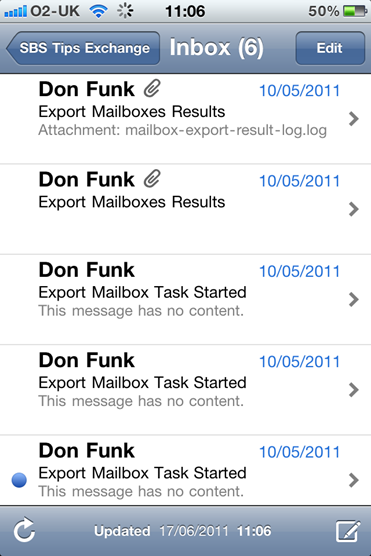 This is just a memorable name so you can distinguish between multiple email accounts on your device. You may be presented with a warning message regarding ‘verification of the server identity’ Click on continue. for more info on why this happens follow my link above regarding autodiscover. In most cases you will now see a new box appear, called Server. This is the public name for your SBS Server. Type this in and click next. Again the phone will show as Verifying. The next page will ask if you which items you want to sync to your phone. Click on Save when you are happy with your selection. Your items will now start to sync to your phone. 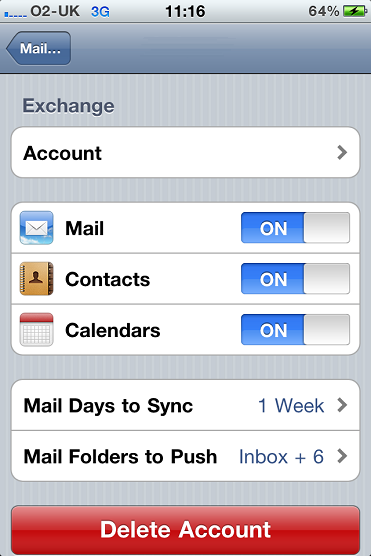 By default the iPhone will only sync the last 3 days of content, so don’t get freaked out if all of your email is ‘missing’. You can change the behaviour in the settings of the account. 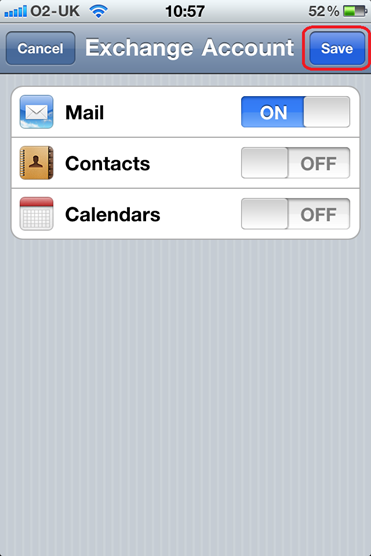 Under, Settings, Mail, Contact, Calendars, find your account by its description. Inside here you can change the sync behaviour. 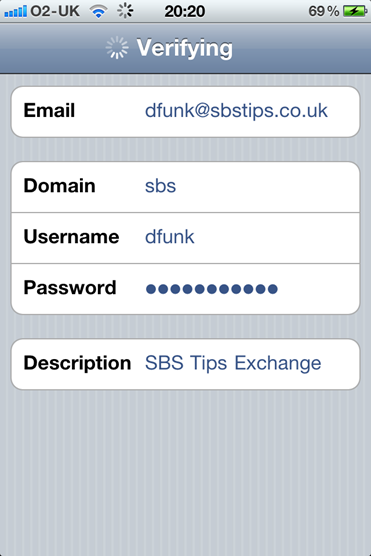 EDIT – 28/10/2011 If you just want to know the settings required to connect your iPhone to your SBS Server, look at this post. I use an iPhone, and i have blogged before on how to use the iPhone configuration utility in order to make deployment of the phones easier for clients. I didn’t cover the iPhone’s ability to use ‘Autodiscover’ in that post, it didn’t occur to me at the time. It didn’t occur to me until the other day, and then i set about confirming how it works, and in what scenarios you can use it to auto-configure a clients phone. Note: When i say External IP of either SBS Server or Exchange Server, i mean the address you would type if you were going to Remote Web App / Remote Web Workplace, eg. remote.domain.com = 123.123.123.123 – this applies even if you are using a third party to provide anti spam or filtering services to your email. 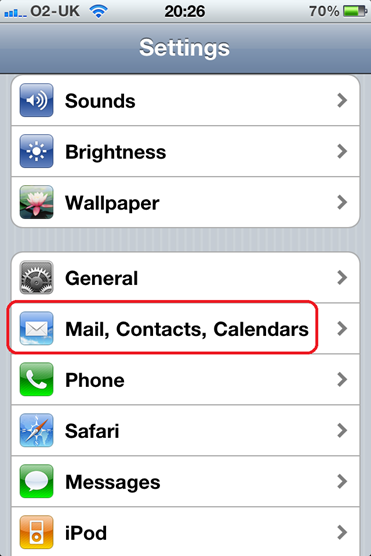 Find ‘mail contacts and calendars’.. 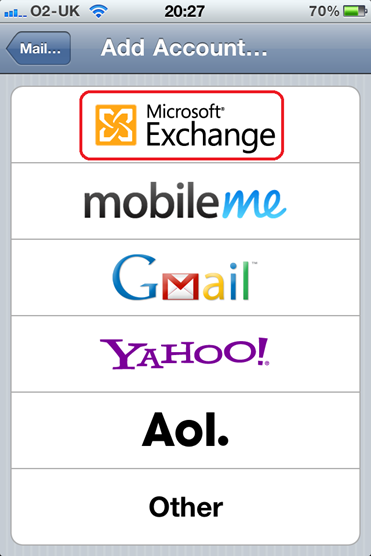 Choosing Add Account.. we can then choose a Microsoft Exchange Account. You are then faced with 5 configurable settings. This is the part that has interested me, and i went to some lengths to find out what the iPhone is actually doing here. The iPhone will use DNS to query for your domains ‘default’ record – this is usually represented as an @ in your dns zone file.. but not something you are likely see if you are using a third party to host your DNS. Your default record like any other record translates ‘domain.com’ to an IP Address. So for example, if you type in http://domain.com in to your browser, you MAY end up at your website, but you may end up elsewhere. It depends on the configuration of that record. Suffice to say, it most likely does NOT point to your Exchange server. That is a problem. If this query does return an IP address, then the iPhone will attempt the next stage of verification. 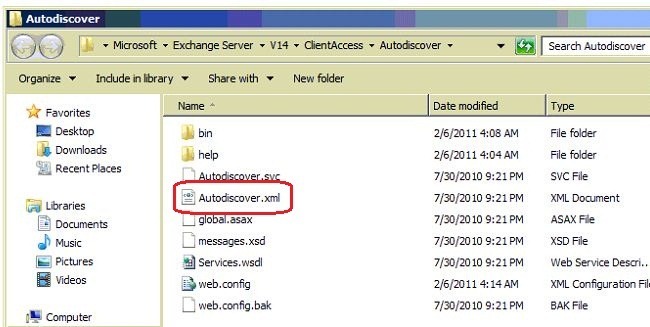 If you do not have an @ default record, for your domain, which is a valid configuration, then of course that query will fail and failover to query for ‘autodiscover.domain.com’. This XML file is located on your exchange server, you can see it within Windows Explorer. It will attempt to login to the server with the username and password provided. 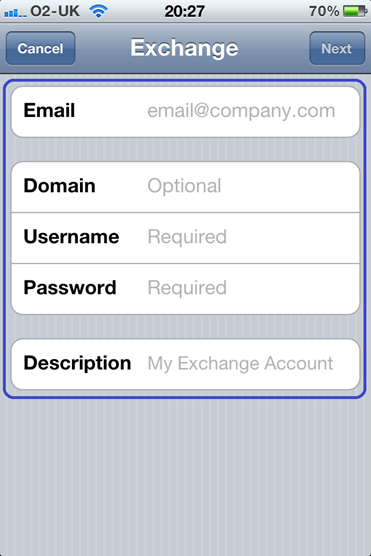 If successful – your iPhone will be auto configured for your Exchange servers address. You can then continue to finish the setup of your account. If an HTTPS connection fails, then the process is repeated on HTTP. Of course that’s fine to just enter at that stage – but it may be useful for some to know how to get this bit to work. You must either point your domains @ record to the your Exchange Servers public IP address. Delete the @ record from DNS and then setup a new A Host record, for ‘Autodiscover.domain.com’ and point that to your Exchange Servers public IP address. I am making no recommendation on which option to choose, however i personally chose to delete my ‘default’ record and nothing bad has happened. What other things will prevent a smooth auto configure? A self issued, or incorrectly named certificate. 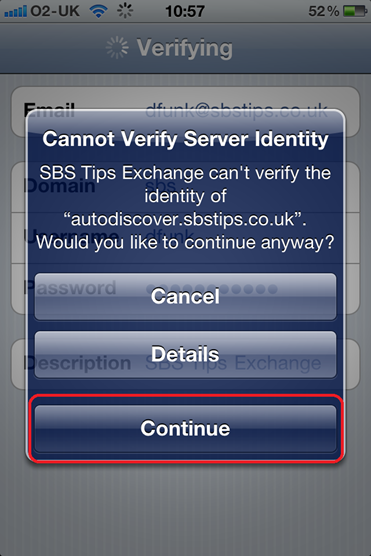 Now most people will know with an iPhone you can simply ignore invalid certificates, BUT this is an extra prompt, and in the spirit of removing those obstacles to your users you should consider getting a UCC certificate for your SBS Server. 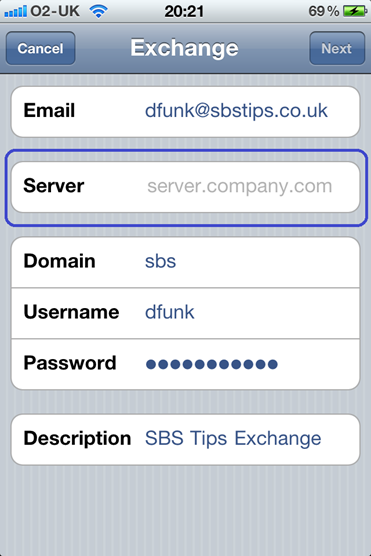 SBS Server will run perfectly well with a single name certificate – in fact it is designed with this in mind. However the price difference between a single name certificate and a UCC certificate has come down considerably so now there is a good case for using a UCC instead. If the iPhone could use the DNS SRV record method for attempting autodiscovery – like Outlook clients can, then we could stick with a single name certificate.